It's great that the T-P is being forthright with its readers, but I don't think attempting to scrub all evidence of what they considered an error was the correct approach. 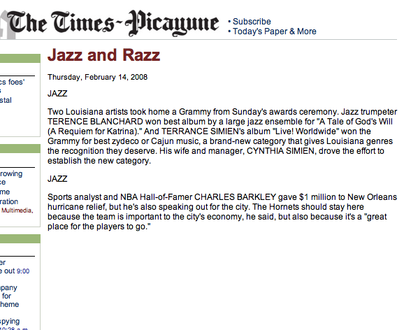 Keeping the Web versions of the razz and the LTTEs online, but appending an editor's note to each, would've been the right -- and the transparent -- thing to do...and would have given the impression that the paper was attempting to right a wrong, rather than cover its mistakes. Now this is getting ridiculous. 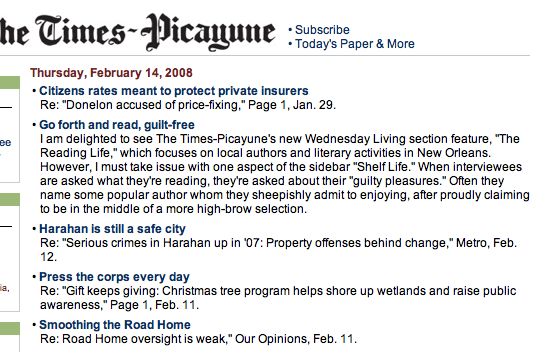 After scrubbing its editorial page criticism of New Orleans mayor Ray Nagin -- first in the print edition(s), and then in its online edition -- the Times-Picayune seems to have removed two letters to the editor about the incident from its website, replacing them with two different letters that did not appear on the main editorial page of today's edition. What were they thinking? 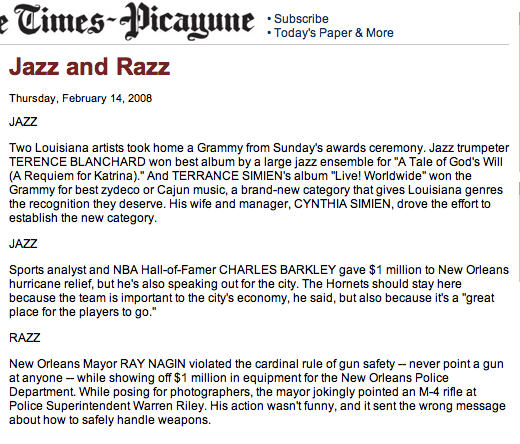 I said my thoughts out loud as I saw the appalling photo of Mayor Ray Nagin and Police Superintendent Warren Riley accompanying reporter Walt Philbin's article on new police equipment in Wednesday's morning paper. I hope I am not the only one in New Orleans who believes this picture shows grossly inappropriate behavior on the part of the mayor and police superintendent. 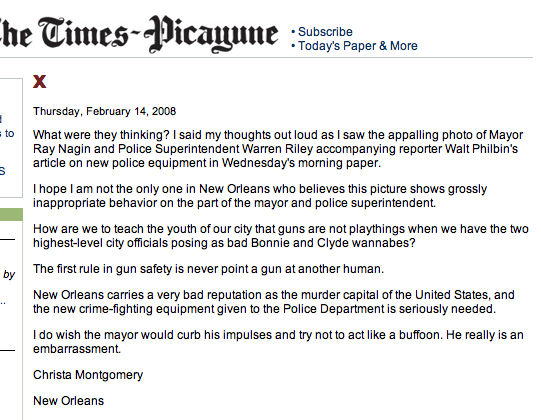 How are we to teach the youth of our city that guns are not playthings when we have the two highest-level city officials posing as bad Bonnie and Clyde wannabes? The first rule in gun safety is never point a gun at another human. New Orleans carries a very bad reputation as the murder capital of the United States, and the new crime-fighting equipment given to the Police Department is seriously needed. I do wish the mayor would curb his impulses and try not to act like a buffoon. He really is an embarrassment. 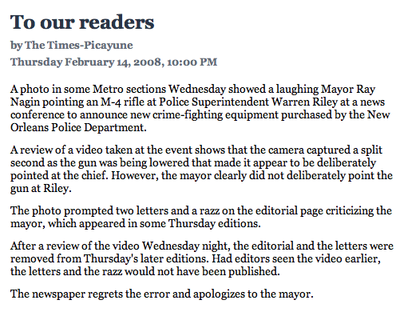 I can't believe I saw a picture with our good Mayor Ray Nagin pointing a rifle at Police Superintendent Warren Riley in Wednesday's paper. What's even more unbelievable is the fact that Riley finds it funny. What ignorance! 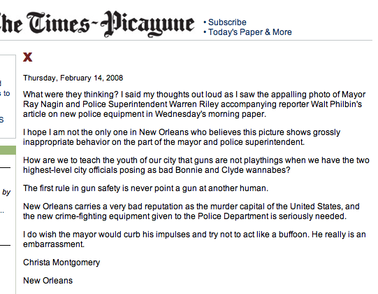 I've got an email query out to the Times-Picayune's editorial page editor Terri Troncale about the whole matter, and will be curious to hear the paper's explanation. 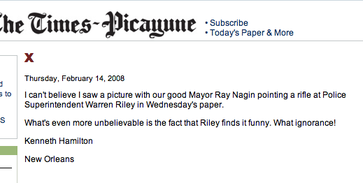 That Times-Picayune editorial page slap at New Orleans mayor Ray Nagin over That Photo? 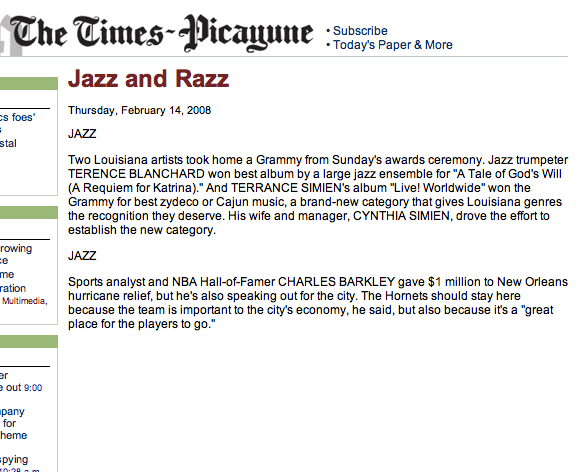 First it disappeared from the print edition, and now the online copy has been memory-holed as well. Curiouser and curiouser. Don't they know that in the Internet age nothing ever really disappears? 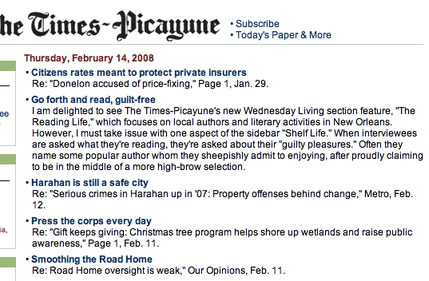 I've got a query into the Times-Pic's editorial page editor Terri Troncale to see what she says about it. 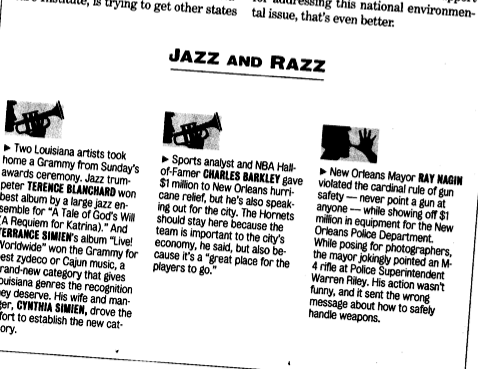 The Times-Picayune editorial page: bowdlerized? Looks like someone on the Times-Picayune editorial board got cold feet about taking New Orleans mayor Ray Nagin to task over That Photo. 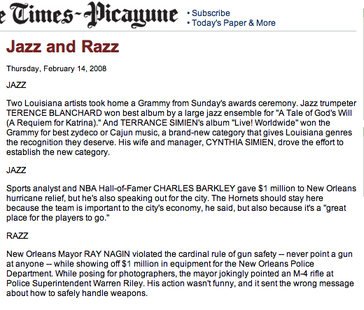 New Orleans Mayor RAY NAGIN violated the cardinal rule of gun safety -- never point a gun at anyone -- while showing off $1 million in equipment for the New Orleans Police Department. 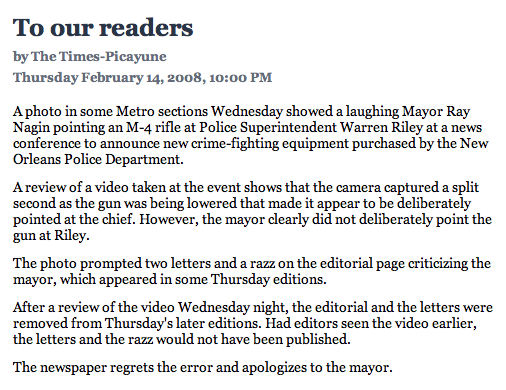 While posing for photographers, the mayor jokingly pointed an M-4 rifle at Police Superintendent Warren Riley. His action wasn't funny, and it sent the wrong message about how to safely handle weapons. I'd love to read the emails and hear the phone calls that occasioned this non-correction. Retired NBA player Latrell Sprewell did not sign with the Seattle SuperSonics and did not say, "My coach-choking days are behind me. We're both older and wiser. Besides, I have lawyers to pay and pit bulls to feed." 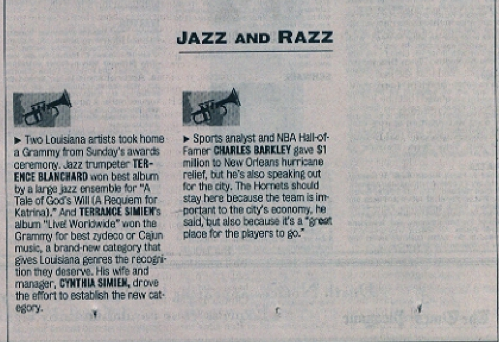 The item, which appeared in Thursday's Sports section, came from a satirical column in the Contra Costa Times. Heaven forbid they ever stumble on The Onion, or we're going to have reprints of stories like "World Leaders Gather To Roast Mahmoud Ahmadinejad." Nell and Wallace Crain, a couple who were featured in an Express-News Page 1A story and photo on "the secret to a happy marriage," died between the writing of the story last summer and its publication in the San Antonio Express-News on Monday. The deaths were not mentioned in the report. The Express-News apologizes to family and friends of the couple, and to our readers, for the egregious omission. You can't really blame Al Gore for not using footnotes in his new book, "The Assault on Reason." It's a sprawling, untidy blast of indignation, and annotating it with footnotes would be like trying to slip rubber bands around a puddle of quicksilver. Andrew Ferguson's June 10 Outlook article, "What Al Wishes Abe Said," said that former vice president Al Gore's book "The Assault on Reason" does not contain footnotes. The book contains 20 pages of endnotes.